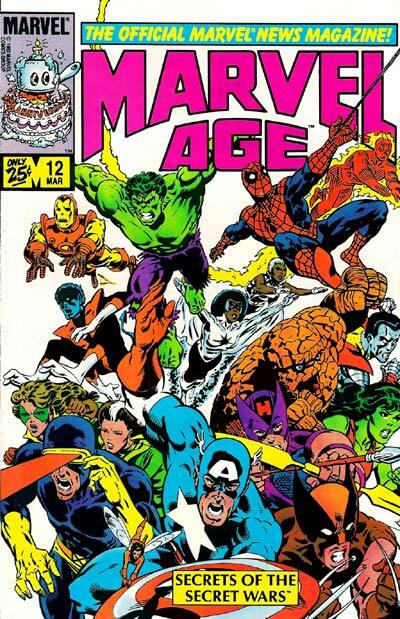 Along with Fear Itself, Age of Ultron was my second Marvel event that I didn’t follow. 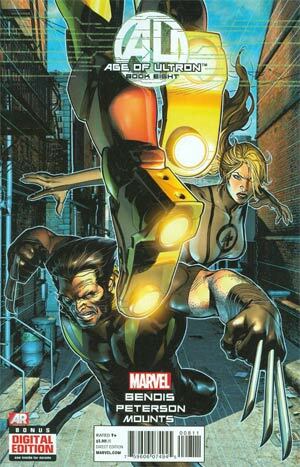 It was billed as mainly an Avenger event with Emma Frost and Wolverine appearing in it. I read it in the store, or at least skimmed it and nothing seemed to be overly amazing about it. In issue two and four, there is a wall of photos that I can’t tell if Kitty is one of the images. 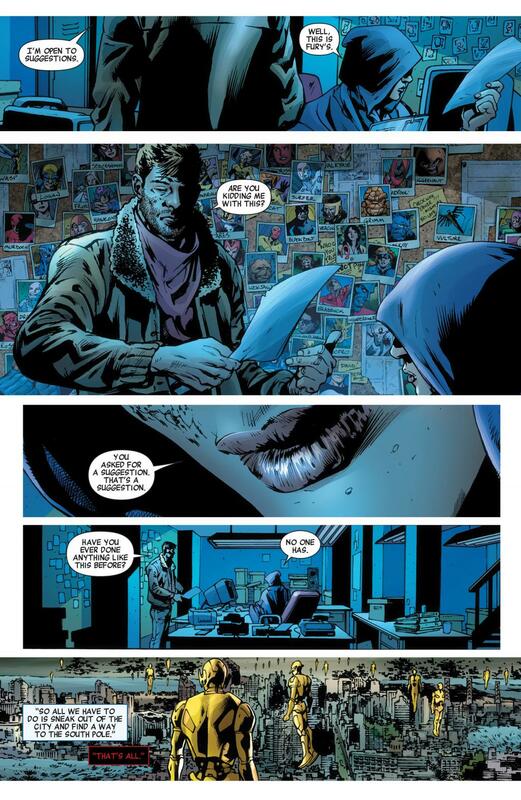 In issue two, the photo in question has a clear blonde with a red shirt and black mask, but in issue four, she has a blue shirt and blue mask, like Kitty’s 80s Excalibur costume. Hastings still is trying to sell those two issues for three dollars each, and that’s just too much for something that doesn’t really count as an appearance. She is below Beast and above Nightcrawler and Magneto so it makes me think that she is suppose to be Kitty but now she looks like Carol Danvers there. Google Images is really letting me down on finding the exact same image but from issue four, I believe it is the only difference and I’m probably the only Kitty Pryde fan trying to figure out if I need to buy it or not. Turns out, that is Cassandra Lang, not Carol Danvers from our friends at Marvel Database. But see how blue is the photo is the second time around? That could be Kitty but should I buy the issue? I’m not sure. Another nice thing is that issue of these issues ends with a cast list and Kitty wasn’t on any of those. So each issue, I will flip to the back, not see her and not be all that interested. To issue eight, Kitty is for sure in this but if you are not looking for her, you will miss her. In the previous issue, Wolverine and Sue Richards – the last survivors of our Marvel Universe, but at the end of it when Ultron has killed all but a handful of characters. So last issue, Wolverine straight up kills Hank Pym right before he creates Ultron, in Avengers 54 / 55 July and August 1968. In this new time line, Morgan Le Fey – who I only really know from Busiek and Perez’s opening arc on Avengers – is the main threat of the era. This issue opens with Iron Man, reviewing the former time line. 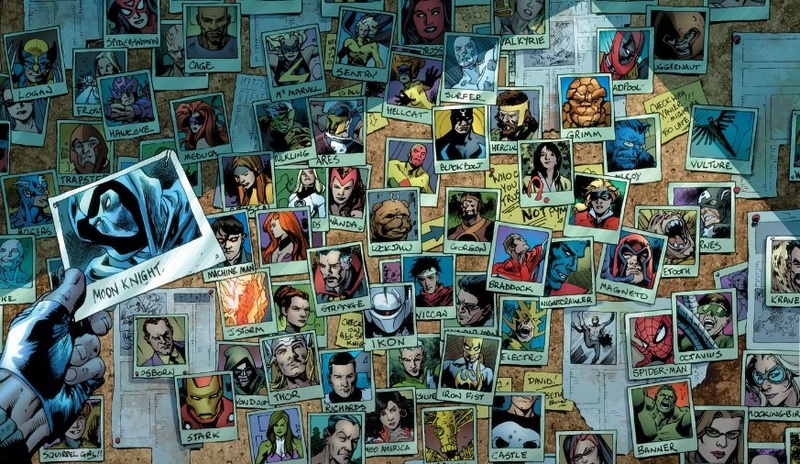 The very first image we see is a circle showing the Marvel Age 12 cover of Secret Wars 1, where Kitty is on the cover between Cyclops and Nightcrawler. We also see a bubble of Wanda from House of M, Mariko and Wolverine, Sue at the birth of one of her children and Ultron from the first issue of this series. Tony is revealing all of this information, in disbelief. He can’t believe that these two broke time. There has to be a better way. We see his two advisors, Xavier and Emma – who is far more bustier than she has ever been shown before and overly so. Come on Peterson, dial it back some! These two telepaths confirm that Sue and Wolverine’s memories are too in sync to be fake. Emma has this great line of “You know my feeling, something this insane has to be what it is.” Before that, Xavier and Emma have a little fun with all the nicknames Wolverine has had over time. Stark orders them to tell the Defenders to leave the Hellicarrier, which is Tony’s base of operations. The Defenders are the premier super hero team after the Avengers disband over Pym’s death. The Defenders are – Colonial America (not sure if he will one day become a zombie, he has an eye patch over his left eye), Wasp (in a Captain Marvel style suit), Thing (with a slew of puncture hole / grater types of damage), Wolverine (in his classic tan costume) Husk (looking normal), Cyclops (going by Cable, has only a slit in his visor over his left eye), Star Lord (in a silly Hydra knock off costume with an even sillier helmet – I thought he was a male Dazzler at first) and Dr. Strange. Wolverine and Sue are in two separate interrogation rooms and I really like Mounts coloring choices here with the lightning. It feels like a real interrogation room, the rooms are cast in green light and they look sickly. Tony is interviewing Wolverine. Tony reveals that he had a security camera in the room where Wolverine slays Pym as Sue watches. The heroes of the day thought it had to be Skrulls. Wolverine wants a beer. Tony tells him that he was torn in half during the Latveria – Asgard Wars, which was the last time he saw Thor. Sue generates force fields to break her confinement. Emma and Xavier tell the Defenders to leave. They do not want to leave. Dr. Strange uses the spell, Vishanti Spell of Disorientation, Book of Vishanti page 73 to get the Defenders pass the telepaths. Tony asks Wolverine why they didn’t use a Time Release Virus. Wolverine tells him that Reed was dead and his Tony didn’t come up with that idea. I do believe they do use this in issue nine. I haven’t read issue ten, as it was poly bagged but the only things I know that occurred in that issue are – Angela leaves the Image Universe for Marvel Proper and Galactus goes to the Ultimate Universe. Thing, Cyclops and Wolverine get to Sue’s room. They can’t see her, she snuck out as they came in as she was invisible. Tony can see her, as he sees all spectrums. 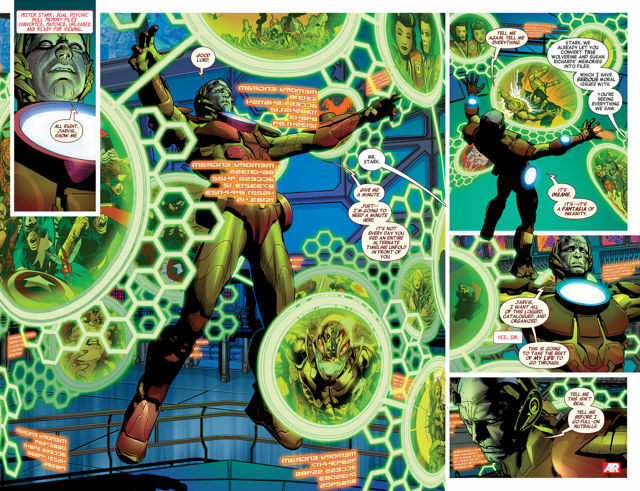 Before anyone can do anything, Morgan Le Fey and an army of horned Doombots attack the helicarrier. Dr. Strange casts the following spells – Evanodor Attack Spell, Scroll of Wabawab / Massentear’s Levitation Spell, from the Oral Scrolls of Tooli / Evanodor Compatriot Boost Spell, Scroll of Wabawab. The two Wolverines exchange a look. Morgan Le Fey tells Tony that she doesn’t understand what plan he is accusing her of committing. She asks him to turn around, as she doesn’t want him to miss the final page moment, the hellicarrier crashing down on New York City. This is the only issue of this series that I own, so this is it for us here at S&FwM.